There were several small issues a lot of them had, which combined to stall their calculations. One of the more important problems was about how the calculator interprets what they type into it, which is really in essence about the order of operations. When I look at the formula above, I see many pieces that are put together in various ways to make a number called “PV”. These pieces are combined using various operations, and are also held together in order to go into these operations with various grouping symbols. Some of these things have a stronger “hold” than others and will enforce certain things to be done before other things are done if I were to actually do this calculation. This is the “order of operations”. I’ve written about it before, but I’ve moved on in my thinking quite a bit since then! Anyway, this order of operations allows me to analyse the expression above and tells me that the r/n on the bottom there is held together before it becomes part of the larger division. It tells me that the r/n inside the brackets is more important to calculate before the “1+”. I also know, though it’s not written in my order of operatons picture, that the little -nt is all inside the top of that power, and needs to be done before I can resolve the power itself. Unfortunately, the scientific calculator (or Excel, or Wolfram Alpha) is less clever than this. When I type things into the calculator, it can’t see the physical arrangement of things on the page. It can’t tell that some things are smaller than others and arranged at the top. It can’t see that there’s a big horizontal line holding the r/n together. The only way the calculator knows to hold things together is with some brackets. So I’m going to have to turn all the things that visually hold things together into brackets. I find this sort of discussion very important and very helpful for the student. It’s so important to help them see what is held together by the brackets and by the horizontal lines and the powers. And it’s also so important to help them see that the calculator is like they were a few minutes ago — it can’t tell that those things hold other things together and just needs to be told every time. 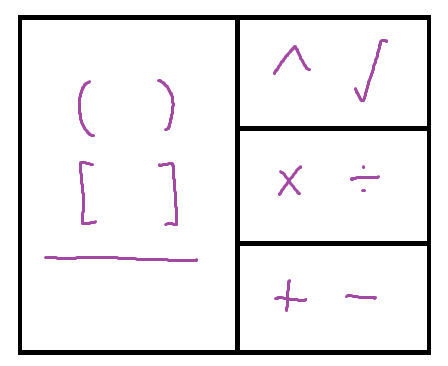 This entry was posted in Thoughts about maths thinking and tagged order of operations. Bookmark the permalink. I teach this skill, too, in my Algebra 1 classes. I sometimes wonder whether better computer/calculator interfaces will eliminate the need for this skill in a couple years. For example, I make a big deal out of the fact that, to square 3/5, you need to type (3/5) with parentheses. But that’s actually not true in the newer graphing calculators. I don’t think we’ll eliminate this skill in its entirety for quite a long time! Firstly, there will be for quite some time yet, interfaces that are more computer-programmy (like Excel and the fancy statistics manipulation software). Secondly, this discussion often highlights they don’t actually know what the powers or fraction bars are doing anyway. Something that is able to copy their writing and interpret it might mask that misunderstanding!